Posted November 6, 2018 at 12:04 am . 0 comments. 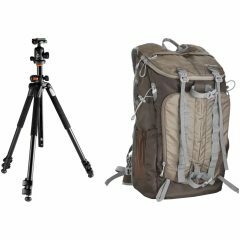 B&H Photo Video has a bundle of the Vanguard Alta Pro 264AB Tripod with SBH-100 Ball Head and Vanguard Sedona 51 DSLR Backpack (Khaki Green) for $157.98. Click here to check out the deal at B&H Photo Video. This regularly goes for $250, so this is a $92 savings (37%). © 2018 www.cpricewatch.com. www.cpricewatch.com is not affiliated with Canon Inc. or any of its subsidiaries.